A watercolour is no more than a stain. This one is called ‘The Son Sleeps’ and is made by Paul van Dongen. Even without a capital letter indicating The Son, the meaning is clear to the viewer. When you look closely, you can count the brush strokes that make up Jesus. He must have put these down on paper in just a few moments. Even so this speed has produced something that transcends time. That is always the case when you look at someone sleeping. You don’t want this quiet breathing, this peacefulness, to stop. A person sleeping has one foot in eternity. Indeed, in this way a father looks at his newborn child or a lover at her beloved who has fallen asleep next to her for the first time. This is, one might say, the exercise that Paul van Dongen imposed on himself. Capture a lying and desirable male body in such a way that it does not stir up desire to wake it, but on the contrary to leave it undisturbed. Van Dongen practices the difficult art of the bubble. It is as if the water used for painting became spontaneously iridescent. Do not touch me, for then I will explode. Do not touch me. Suddenly I understand the words that the risen Jesus spoke to Mary Magdalene (John 20:17: ‘Do not hold on to me’). There is no power more powerful than that of the bubble demanding that it will not be touched. It goes against the natural order of things to not want to grasp what is most dear. It is a poetic power. At the moment of ‘Noli me tangere’ Jesus is – not for the first time – a creator. He makes Mary Magdalene into a free human being, someone who cuts across her first impulse. By renouncing the urge to have, she becomes the bride of Christ. It is of utmost importance that Christ really stands before her ‘in the flesh’. Touchable. Her faith is not a matter of ideas or abstractions. She does not believe in ‘something’ but she sees someone she loves, as a beloved sees her lover. She will feel the pain of the physical yearning, later when he has left the earth. The Incarnation is first of all a physical event. Also that moment is, I think, contained in the stain of Van Dongen. The impulse to wake Jesus up to ask him for redemption, for comfort and compassion, is suppressed. Willem Jan Otten (1951) is a writer and lover of the visual art of Paul van Dongen. His last book with essays about poetry, film and faith appeared in 2009: Onze Lieve Vrouwe van de Schemering (nominated for the AKO-literatuurprijs 2010). His last book of poetry is Welkom (2008). 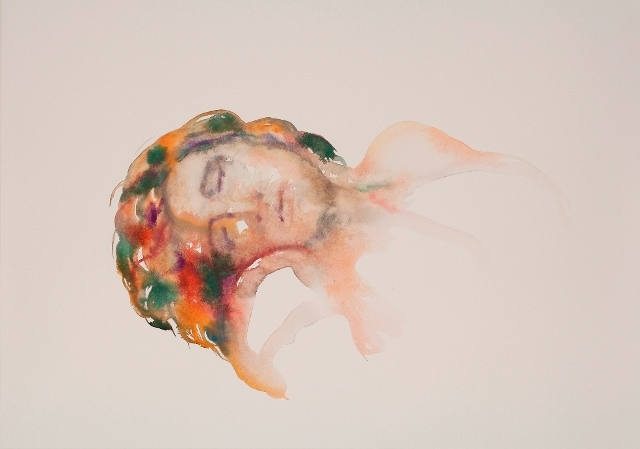 Paul van Dongen: The Son Sleeps, watercolour, 2010.